If you have any questions about the HAMPSHIRE information page below please contact us. 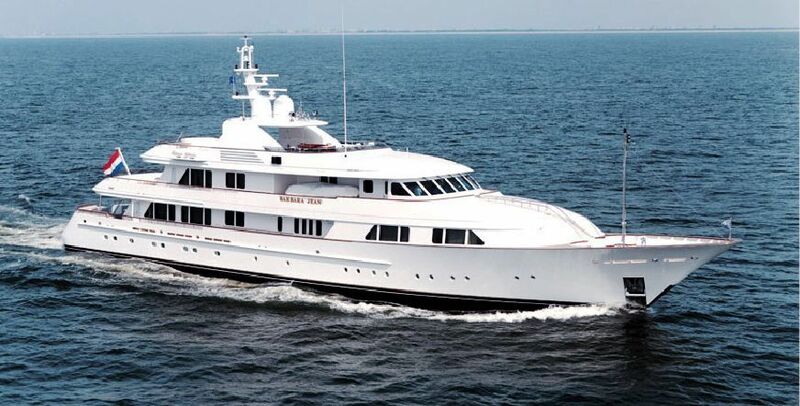 Feadship finished building motor yacht HAMPSHIRE in 2001. Therefore, she is built in the Netherlands. HAMPSHIRE had yacht design and naval architecture created by De Voogt Naval Architects and De Voogt Naval Architects. 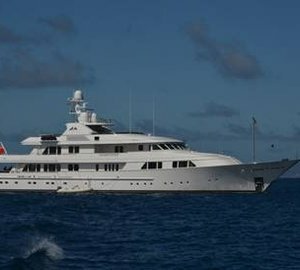 This superyacht HAMPSHIRE is able to accommodate the sum total of 12 passengers all told aboard together with around 15 qualified crew. Finished and launched for 2001 this boat’s interior design and decor reflects the design knowledge of owner and John Munford. M/Y HAMPSHIRE was built by Feadship De Vries Scheepsbouw in 2001 as Barbara Jean (she is said to be commissioned by the former owner of Lady Columbo.) She has since been refitted at Compositeworks in La Ciotat where a new interior to a design of Redman Whiteley & Dixon was installed. De Voogt Naval Architects was the naval architect firm involved in the formal superyacht design work for HAMPSHIRE. Also the company De Voogt Naval Architects expertly worked on this undertaking. Interior designer John Munford was responsible for the internal interior ambience. In 2001 she was formally launched with accolade in Aalsmeer and post sea trials and finishing touches was afterwards passed on to the owner who commissioned her. The Feadship De Vries Shipyard completed their new build motor yacht in the Netherlands. A fairly large area is achieved with a total beam (width) of 9.6 m or 31.5 feet. With a 2.8m (9.2ft) draught (maximum depth) she is shallow. The material steel was used in the building of the hull of the motor yacht. Her superstructure above deck is fashioned out of aluminium. In 2005 further refitting and modernisation was also performed. The 3512B DITA engine installed in the motor yacht is made by CATERPILLAR. She is driven by twin screw propellers. The main engine of the yacht gives 1520 horse power (or 1118 kilowatts). She is fitted with 2 engines. The total thrust for the yacht is thus 3040 HP or 2237 KW. With respect to stabalisers she was supplied with Koopnautic. The bow thrusters are Hrp. Bestowing quarters for a maximum of 12 yacht guests overnighting, the HAMPSHIRE accommodates them in luxury. She also uses around 15 proficient crew members to maintain and sail. 56.5 metres / 185.4 feet. Giving the combined power of 3040 HP /2237 KW. 4900 at a speed of 13 knots. Caterpillar 2 times 180 kilowatts. During October 2009 HAMPSHIRE visited Argostólion, in Greece. This motor yacht also traveled the waters near Kefallinía during October 2009. Heinen & Hopman is the company which made the air conditioning system on this vessel. HAMPSHIRE features a teak deck. The luxury yacht HAMPSHIRE displayed on this page is merely informational and she is not necessarily available for yacht charter or for sale, nor is she represented or marketed in anyway by CharterWorld. This web page and the superyacht information contained herein is not contractual. All yacht specifications and informations are displayed in good faith but CharterWorld does not warrant or assume any legal liability or responsibility for the current accuracy, completeness, validity, or usefulness of any superyacht information and/or images displayed. All boat information is subject to change without prior notice and may not be current.